Dr. John P. Kotter (born 1947) is the Konosuke Matsushita Professor of Leadership, Emeritus, at the Harvard Business School, a New York Times best-selling author, the chairman of Kotter International (a management consulting firm based in Seattle and Boston), and a well-known thought leader in the fields of business, leadership, and change. Professor Kotter’s MIT and Harvard education laid the foundation for his life-long passion for educating, motivating and helping people. He became a member of the Harvard Business School faculty in 1972. By 1980, at the age of 33, Kotter was given tenure and a full Professorship—the youngest person ever to have received that award at the Business School. John Kotter’s international bestseller Leading Change—which outlined an actionable, eight-step process for implementing successful transformations—has become the change bible for managers around the world. Our Iceberg Is Melting, the New York Times bestseller, puts the eight-step process within an allegory, making it accessible to the broad range of people needed to effect major organizational transformations. In October 2001, Business Week magazine rated Kotter the #1 “leadership guru” in America based on a survey they conducted of 504 enterprises. 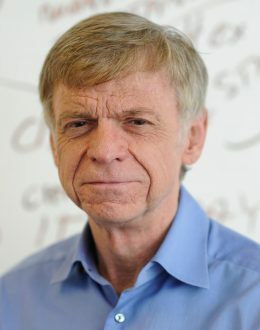 Professor Kotter is the author of eighteen books, a collection that has given him more honors and awards than any other writer on the topics of leadership and change. In addition to Buy In (2010), A Sense of Urgency (2008), Our Iceberg Is Melting (2006), and Leading Change (1996), he is the author of The Heart of Change (2002), John P. Kotter on What leaders Really Do (1999), Matsushita Leadership (1997), The New Rules (1995), Corporate Culture and Performance (1992), A Force for Change (1990), The Leadership Factor (1988), Power and Influence (1985), The General Managers (1982), and five other books published in the 1970s. Professor Kotter’s books have been printed in over 120 foreign language editions, and total sales exceed two million copies. He has created three executive videos; one on “Leadership” (1991), another on “Corporate Culture” (1993), a third on “Succeeding in a Changing World” (2007) and an educational CD-ROM, “Realizing Change” (1998) based on the Leading Change book. Professor Kotter’s honors include an Exxon Award for Innovation in Graduate Business School Curriculum Design, and a Johnson, Smith & Knisely Award for New Perspectives in Business Leadership. In 1996, Professor Kotter’s Leading Change was named the #1 management book of the year by Management General. In 1998, his Matsushita Leadership won first place in the Financial Times, Booz-Allen Global Business Book Competition for biography/autobiography. In 2003, a video version of a story from his book, The Heart of Change won a Telly Award. In 2006, Kotter received the prestigious McFeely Award for “outstanding contributions to leadership and management development.” In 2007, his video “Succeeding in a Changing World” was named best video training product of the year by Training Media Review and also won a Telly Award. John Kotter lives in Cambridge, Massachusetts and Ashland, New Hampshire.